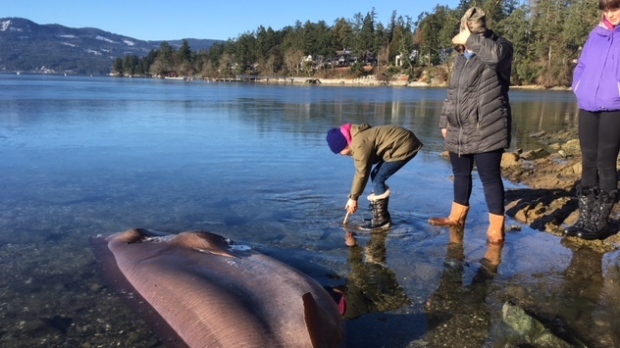 A bizarre-looking shark that washed up in a North Saanich bay was a pregnant female, according to federal scientists. 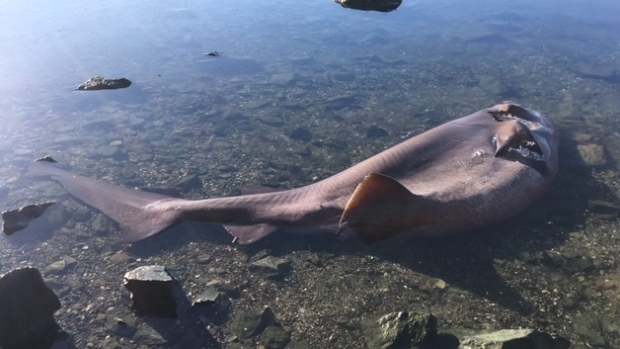 The carcass of a nearly four-metre-long bluntnose sixgill shark was found on the shore of Coles Bay Tuesday. The deepwater shark isn't uncommon in B.C. waters, but it's usually found in depths of up to 200 metres – though it can dive as deep as 2,000 metres. Scientists with the Department of Fisheries and Oceans have confirmed the shark was an adult female that was pregnant, though it's still unclear how far along her pups were. "The interesting part for this area in the Strait of Georgia of some of the sounds off the west coast of the island is that pregnant females come into near-shore areas to give birth," said DFO research scientist Jackie King. "It appears to be a rearing area." Initial examinations of the animal do not show any apparent boat strikes or entanglements from fishing gear, King said. While the cause of death hasn't been determined, King said it's not the first time a sixgill shark has died while pregnant. "[These] sharks give birth to live young," she said. "It could just be a complication." Bluntnose sixgill sharks are listed as a species of concern under Canada's Species at Risk act, meaning their numbers have declined in a very short timeframe but not enough to be considered threatened or endangered. Researchers were expected to take tissue samples from the carcass on Wednesday, investigate what the shark was eating before it died and determine whether it had microplastics in its system. In the meantime, the carcass has been attracting attention from beachgoers who say they've never seen anything like it. "Why it's here and what it died from is kind of sad, you don't know the reasoning behind it, but to be able to see this, it's pretty cool," said Nicole Wilford. King said after a necropsy is performed on the beach, the carcass will likely be left to Mother Nature to take care of. She thanked the public for reporting the sighting to the DFO, and encouraged anyone who spots a shark to call it in at 1-877-507-4275.